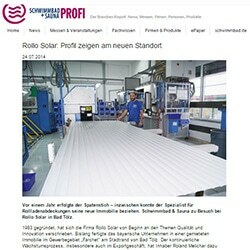 The Rollo Solar GmbH in the press, get your own impressions about our company, employees and products. Regional newspaper - "What have celebrities such as Vladimir Putin, Mehmet Scholl, Oliver Kahn, Susanne Klatten, Hansi Hinterseer and about 1200 leading-luxury hotels like Schloss Elmau, Lanserhof in common and what does that have to do with Bad Toelz? Two questions, one answer:? Pool Covers made by Rollo Solar. " Pool + Sauna -. 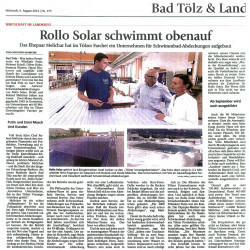 "Not only built for research- and development purposes Rollo Solar build a private exhibition pool at its company headquarter in order to perform product tests. In terms of quality and safety, the company works closely with the TÜV-Süd, which certified the quality of the profiles again"
Pool Magazin - "Heart shaped pool covered - With a pool cover you show that you are energy efficient and care about the environmental protection. The cover for the heart shaped pool shows once again that the pool industry expertise meet customer requests impressively." BSW - "Out of the two-man business, the two have made a medium-sized enterprised, with around 60 employees, that sells its premium pool cover "Made in Germany" internationally, for e.g. in Belgium, Austria, Russia, Switzerland, Spain etc. " Interest!? Use our contact form.